The Myles table makes a bold statement in any contemporary setting. Its tight lines and scale works well in large rooms. We can design and construct a Myles table to seat virtually any number of people in comfort and elegance. 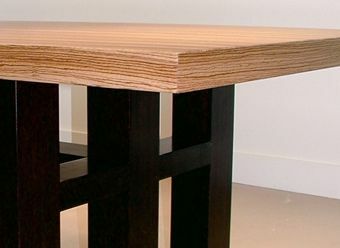 The torsion box table top sits atop the massive interconnected "H" columns making a surprisingly light table that is strong and stable. 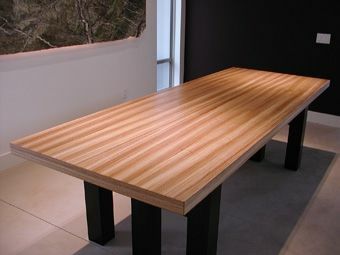 As shown: zebrawood solid wood, with a durable clear topcoat. Base columns are ebonized mahogany. Available in a variety of domestic hardwoods, exotic woods, burls and finish options. Pricing varies with dimensions, wood species. Dimensions: As shown: 120"L x 46"W x 29-1/2"H. Custom dimensions and shapes available.